How should I file a claim? Car accidents are a leading cause of death and injury in the United States. In Virginia alone, 753 people were killed, and 65,029 were injured in traffic crashes in 2015. This includes motorcycle accidents, collisions involving large commercial trucks, and passenger vehicle wrecks. Alcohol-related crashes in Virginia were responsible for 241 fatalities and 4,917 injuries in 2015 alone. How should I file auto insurance and car accident claims? Virginia is a “fault” state when it comes to auto insurance, which means that the at-fault driver is responsible for injuries caused in an accident. File a claim with your own insurance company. File a third-party claim with the other driver’s insurance company. File a lawsuit in court to pursue compensation for all damages. Please remember, you should NEVER make a statement to the other driver’s insurance company without speaking with a lawyer and discussing your options. An unintentional misspoken word or phrase could harm your case. Even your own insurance company may not want to pay what you deserve. A skilled car accident attorney like the ones at GibsonSingleton Virginia Injury Attorneys will help you pursue those benefits. How do I get my car repaired or replaced? Collision coverage on auto insurance policies helps pay for the repair or replacement costs of your vehicle. If the driver who caused your accident is insured, his collision coverage will pay for your “property claim,” or the repair or replacement of your vehicle. If the other driver is uninsured, then your car is repaired or replaced through your own auto insurance collision coverage. 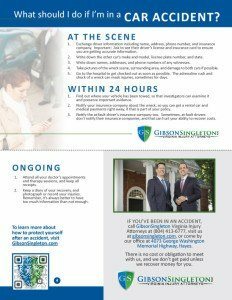 Although GibsonSingleton Virginia Injury Attorneys takes no fee for assisting clients with a property damage claim, we try to help you with this process if you need help. Most personal injury law firms do not provide this service. Many car insurance companies assign one claims adjuster to handle a personal/bodily injury claim, and a different claims adjuster for the “property claim” to deal with arranging for the repair of your vehicle or reimbursing you for the value of your car if it’s totaled during the wreck. Am I entitled to a rental car while my car is being repaired? Yes, Virginia law requires that an insurance company pay for a comparable rental car during the time that a client’s car is being repaired, as well as during the time it takes the insurance company to provide the client an offer for the total loss of his car. For example, if you were driving a Ford F-150 when the wreck happened, don’t let the insurance company try to put you in a compact car. They are required to put you in a rental car that is comparable to your now-damaged vehicle. What do I do about uninsured/underinsured driver car accident claims? Owners of vehicles in Virginia are not required to carry car insurance if they pay a $500 uninsured motor vehicle fee to the DMV. Accordingly, the Commonwealth requires that every car insurance policy include uninsured/underinsured motorist coverage in an amount equal to the policy’s liability coverage limits, unless the policyholder requests lower limits in writing. If you are involved in an accident caused by a driver with no insurance or insufficient insurance to cover your losses, you can file for compensation under the uninsured/underinsured motorist coverage of your own auto insurance policy. This coverage should also apply if you are involved in an accident caused by a hit-and-run driver. The actions you take at the scene of an accident can make a significant difference in the outcome of your case. 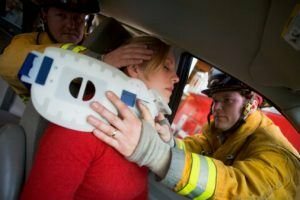 For accidents with major injuries, you need a knowledgeable attorney with car accident experience to protect your interests. Attorney John Singleton has worked for a large insurance defense law firm and has an in-depth understanding of how insurance companies operate. He uses this knowledge to your advantage when dealing with insurance companies about a personal injury claim. Attorney Ken Gibson is a former Federal Prosecutor at the U.S. Department of Justice in Washington, D.C., and also has the legal experience to get the best possible results for you. Car accidents, including bike accidents and pedestrian accidents, can cause serious injuries, pain and suffering, medical expenses, insurance hassles, and lost wages. GibsonSingleton Virginia Injury Attorneys are committed to resolving your case efficiently, and pursuing the highest possible settlement for you. We handle car accident cases on a contingency basis, which means we receive no compensation until we get compensation for you. If you have been involved in a serious car accident, contact us or call us at (804) 413-6777 or toll-free (855) 781-6777 to schedule a free consultation. Notify your insurance company about the wreck, so you can obtain a rental car and medical payments insurance coverage if they are part of your policy. Notify the at-fault driver’s insurance company right away too. Sometimes at-fault drivers do not notify their insurance companies about a wreck right away, and that failure can affect your ability to recover from the at-fault driver’s insurance coverage. Attend all of your doctor’s appointments and therapy sessions, and keep all your receipts. Make sure to find out where your vehicle has been towed, so that investigators can examine your vehicle and preserve important evidence. Keep a diary of your recovery, and photograph and/or record your injuries. Remember, it’s always better to have too much information than not enough. What else should I do after a car accident? Note the other car’s make and model, license plate number, and state. Write down the name, address, and telephone number of any witnesses. Take pictures of the wreck scene, surrounding area, and damages to both cars. Go to the hospital to get checked out. The adrenaline rush and shock of a wreck can mask injuries, sometimes for days. Is it OK to accept a check for my damaged car before we resolve my injury claim? Yes, it’s okay to settle your property claim before our firm resolves your claim for personal injuries. The key is to examine all the paperwork regarding your property claim to make sure that the check you are receiving and the documents you are signing are related only to your property claim and not your personal injury claim in any way. If the cost to repair your car exceeds the "Kelley Blue Book" value, the insurance company will declare your car a total loss and pay you the adjusted "Blue Book" value. If the cost to repair is less than the "Blue Book" value, and your car can be repaired in a reasonable time period, the insurance company should pay for the repairs. Can I negotiate with the insurance company to pay me more money for my car? Yes, you should negotiate with the property claim adjuster if you believe the insurance company is not offering you the fair retail value of your car. If your vehicle is determined to be a total loss, you should check the NADA value (www.NADA.com) to determine, at the month and year that your damage occurred, the retail value of your vehicle with its mileage, options and accessories. Virginia law provides that the NADA is an accepted source of a car’s retail value for purposes of a property claim. A second source to check the retail value of your vehicle is www.Edmunds.com, which is another site that allows you to enter the appropriate data to assess value. Note that the insurance company must pay the retail value, not the trade-in or wholesale value. They sometimes use a service called CCI, which is an acceptable appraisal service. Ask for the valuation report from the adjuster before you accept the payment. Remember that post-purchase upgrades such as expensive rims, sound systems, and premium tires should be included in the retail value of your car. Receipts for purchases and installation invoices for these items should be provided to the insurance company so that you can recoup the full value of these additions to your vehicle. Will GibsonSingleton file a lawsuit against the other driver? After discussing the offer made by the insurance company, and giving you our opinion about the value of your case, we will offer our recommendation about filing a lawsuit against the other driver. If we believe the insurance company is not offering a settlement amount that is a fair value of your case, we will recommend filing a lawsuit. However, we will only file a lawsuit with your permission after you have had a full opportunity to discuss this decision with us and ask questions about the process. Keep in mind that if we don’t file a lawsuit, you will likely have to accept the insurance company’s offer. The advantages of filing a lawsuit are that the insurance company must take your case seriously because of the risks posed by a lawsuit. They risk that a jury could award you a higher sum of money than they are currently offering. They must hire and pay a lawyer to defend the driver they insure. They must pay litigation costs and spend more time and effort to deal with your case. The net result is that it puts pressure on the insurance company to raise their offer to avoid the risks and costs of drawn-out litigation and perhaps a trial before a jury. Will I have to answer questions from the other driver’s lawyer? If we file in the General District Court and your case goes to trial, you will be questioned, or “cross-examined,” by the other lawyer. We will thoroughly prepare you for this process, so don’t worry. If we file a lawsuit in the Circuit Court, you will be questioned in a deposition and at trial. In a deposition, the other lawyer, prior to trial, questions you in the presence of a court reporter, who transcribes your answers or “testimony.” The questions will be wide-ranging: about your background, the facts of the accident, and your medical history and treatment. We prepare you for the deposition and are present to help you. If your case goes to trial – and most cases don’t – you will be questioned again by the other driver’s lawyer. We meet with you prior to your deposition and trial to thoroughly prepare you for this process. If I’m in an accident and the other driver was at fault, should I accept a check for my bodily injuries from his insurance company right away? Probably not. Due to the shock of a wreck, sometimes you may not realize you are hurt until a few days after the event. Often minor pain does not seem like a big deal. However, when that pain is still bothering you two months later, you may realize that the collision was much more serious. You do not have to accept what is being offered up-front. It is better to wait to make sure you are completely healed before you accept any money from an insurance company. 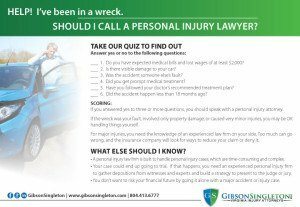 If you have questions or concerns, call GibsonSingleton Virginia Injury Attorneys today at (804) 413-6777 or toll-free (855) 781-6777 for a free consultation. $725,000 Compensation - Man suffered serious injuries after another driver ran a stop sign and crashed into his vehicle. $200,000 Compensation - Woman suffered injuries, including a broken ankle, in a head-on crash. For teens, supplemental driving education can save lives! What should you do if you’re in a car accident? Download and print the PDFs below to keep in your vehicle, so that you will know what to do if you are ever in an accident. Click on the image to download them.